Get students moving around the room and working together to work with polynomials and polynomial functions on these 8 Station Cards. Includes a student recording sheet and teacher answer key. Students match problems to solutions and will know right away if they've solved correctly because of the puzzle! The file contains the student worksheet and teacher answer key. Students will factor using various methods such as grouping, quadratic form, and using sum and difference of cubes. They will then match the polynomials to its factors and students will know right away if they've done it correctly because of the puzzle! The file contains the student worksheet and teacher answer key. 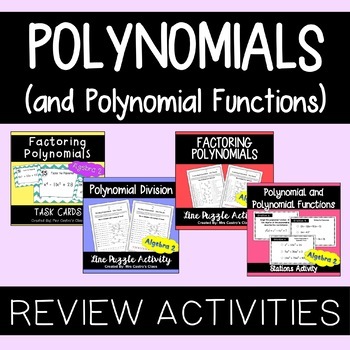 This is a set of 36 task cards covering factoring polynomials! Students will need to use a variety of methods to factor. - Quadratic factoring (Includes common factors, difference of squares, and A>1). The cards can be used for student stations, partner activities, classroom warm-ups, etc. Student recording sheet and teacher answer key included!